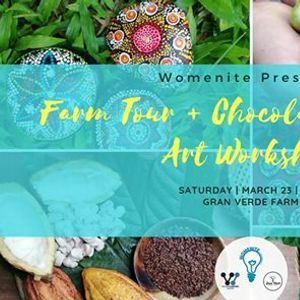 This March's episode of Womenite brings you to communing with nature and igniting that innate creativity in you with our Farm Tour and Mandala Stone Art! Begin your adventure with a chocolate tour and cap it with chocolate mandala art workshop. Your fee of P500 includes refreshments and art materials. 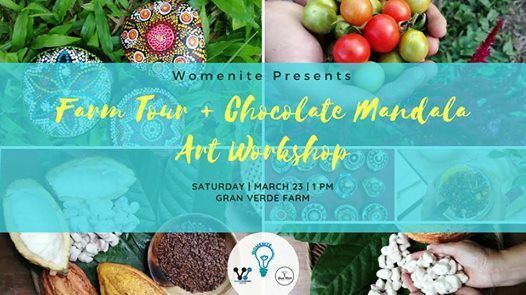 A leisurely 20-minute walking tour that takes you to the cacao grove, bean fermentary and sun drier with product tasting stops in between. Experience opening the cacao pod and taste and experience the sweetest tree-ripened cacao bean pulp. Cap your farm visit by trying roasted cacao hand grinding and molding. You will walk away appreciating and loving every bite of cacao treats. This include cold drinks and light snacks. In this session, you will learn basic mandala patterns and use it to create your own personal mandala. Since mandala is a representation of the universe, we will use nature’s tools in creating it. We will use stones, sticks and twigs in the farm. And instead of paint, we are going to use dark and white chocolates to create our mandalas! Be in your most comfortable outfit and just bring your creativity along with you. No need to bring anything for the session. As a group, we can go together to the farm and share the cost of the public transport. You can bring your vehicle if you like. If you're open, we can contribute to the gas. This event is all about sharing and making new friends. It's more fun to do this as a group! So feel free to let us know your suggestion.. Thank you! 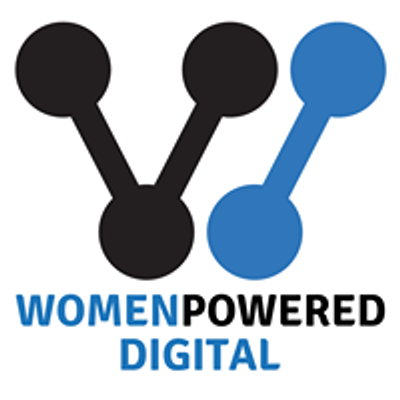 Should you pay via bank deposit or cash, please contact us at Womenpowered Facebook Page for the details. Deadline of booking is 5 days prior to the event.